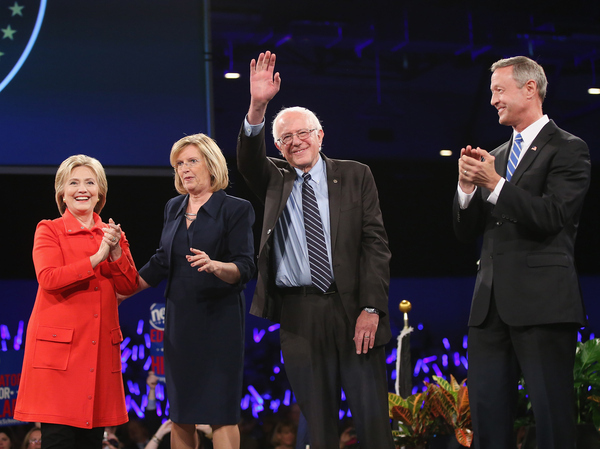 Presidential candidates Bernie Sanders, Hillary Clinton, and Martin O’Malley appear with Iowa Democratic Party Chair Andy McGuire (second from left) at Saturday’s Jefferson-Jackson Dinner in Des Moines. Recently, I had the awesome opportunity to attend the Iowa Democratic Party Jefferson-Jackson Dinner in Des Moines, Iowa. 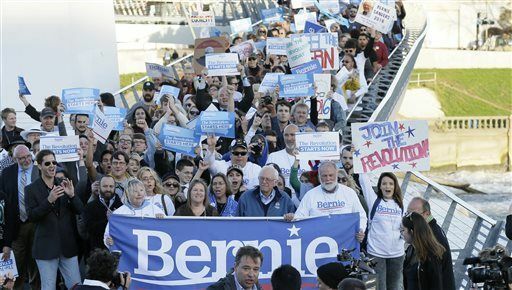 At the event several blocks of downtown Des Moines was turned into a Democratic Party rally. This was one of the largest dinners yet, with a great deal of excitement and energy. I was lucky enough to get a table ticket at this enthusiastic party-building event for the Iowa Democratic Party to get fired up and ready to go for the upcoming 2016 first in the Nation Iowa Caucuses. As we all know, I support Bernie Sanders for President. Bernie delivered a powerful and moving speech to start the political revolution in Iowa to get hundreds of thousands of previously apathetic Americans involved in our nation’s politics. Bernie Sanders understands that the rich in our nation are continuing to get richer while income and wealth inequality has reached astronomical levels. This is why Bernie tackled this issue in his Jefferson-Jackson Dinner address. As we have seen in the polls, Bernie Sanders is running a strong campaign even without the help of power of millionaires and billionaires. In the 2016 New Hampshire Democratic Presidential Primary, Bernie Sanders is ahead of Hillary Clinton. CBS/YouGov has Sanders at 54% and Clinton at 39%. Bloomberg/Saint Anselm/Purple Strategies has sanders at 41% and Clinton at 36%. NBC/WSJ/Marist has Sanders at 48% and Clinton 39%. In the 2016 Iowa Democratic Presidential Caucuses Hillary Clinton is barely leading with Bernie Sanders close behind. Des Moines Register/Bloomberg Politics has Clinton at 48% and Sanders at 41%. I am eager to stand with Bernie Sanders because he stood up for what was right when he faced a fork in the road. Bernie Sanders recognizes the importance of doing more for LGBT rights. Bernie sees that in many states, it is still legal to fire someone for being lesbian, gay, bisexual, and transgender. In addition, it is still legal to deny someone housing for being LGBT. Bernie will fight for change and he will make that change as President. Bernie Sanders is a co-sponsor of the Equality Act, which would expand the 1964 Civil Rights Act and other anti-discrimination laws to include protections for sexual orientation and gender identity. Sign into law the Equality Act, the Every Child Deserves a Family Act, and any other bills that prohibits discrimination against LGBT people. Work with HHS to ensure LGBT Americans have access to comprehensive health insurance which provides appropriate coverage and do not have to fear discrimination or mistreatment from providers. Continue the work of the State Department’s Special Envoy for LGBT rights and ensure the United States helps protect the rights of LGBT people around the world. Require police departments to adopt policies to ensure fairer interactions with transgender people, especially transgender women of color who are often targeted by police unfairly, and institute training programs to promote compliance with fair policies. Bar discrimination against LGBT people by creditors and banks so that people will not be unfairly denied mortgages, credit cards, or student loans. Veto any legislation that purports to “protect” religious liberty at the expense of others’ rights. Bernie Sanders stood against the war in Iraq because he knew it was not a good decision. Bernie sees the damages caused by these disastrous decisions. He sees the thousands of brave men and women who have lost their lives and others who have come home with disabilities. Going forward, Bernie believes that war should be only a last resort. I am proud to support Bernie Sanders in his effort to “break up the largest financial institutions in the country,” who destroyed our nations’ economy. These financial institutions are so-called, “too-big-to-fail,” and they have received a $700 billion bailout from the U.S. taxpayers. They also received more than $16 trillion in nearly zero interest loans from the U.S. Federal Reserve. He introduced the “Too Big to Fail, Too Big to Exist Act,” this would break up the big banks and prohibit any too-big-to-fail institutions from accessing the Federal Reserve’s discount facilities or using insured deposits for risky activities. Bernie is a co-sponsor of the Elizabeth Warren/John McCain bill to reinstate Glass-Steagall. He has proposed a financial transaction tax to reduce risky trading and other forms of Wall Street speculation; the proceeds would be used to provide debt-free public college education. As a college student working on my Associates degree in psychology at Iowa Western Community College I have already accumulated over $10,000 in student loan debt. I come from a poor family who cannot afford to help me pay for my college education. However, I have hope because Bernie Sanders believes that it is time to make college tuition-free and debt-free. He believes that higher education must be a right for all not just wealthy families. Allow Americans to refinance student loans at today’s low interest rates. Allow students to use need-based financial aid and work study programs to make college debt-free. Join the Campaign for Bernie Sanders! Next Would you pay $50,000 a month for a prescription drug?